Earlier this year, the LSE blogged a guest post by Ron Johnston, a geographer at Bristol University. Johnston, along with his colleague Tony Hoare, is the author of an important 2010 paper which found that “students with high A-level scores are more likely to get first-class degrees, but students from state schools with such high scores are more likely to achieve the highest degree grade than are students with similar scores who attended independent schools“. Here, Johnston is talking about the new student loan structure, and his post is framed in terms of falling recruitment to postgraduate courses. Will Hutton had previously written about student fees leaving graduates too skint to consider a taught masters, and Johnston notes the picture is actually much grimmer than Hutton painted. 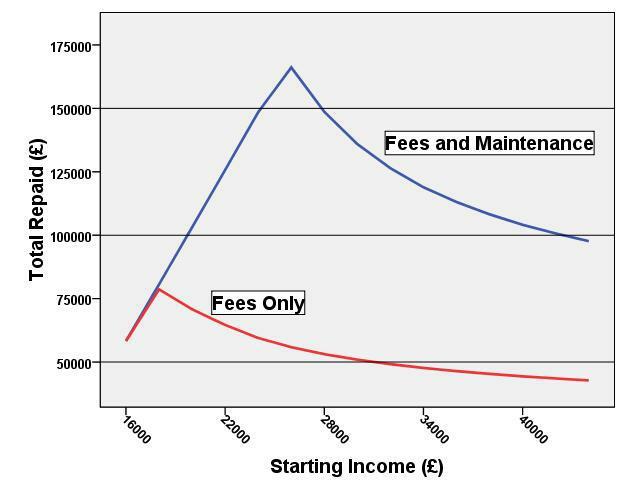 While I fully agree that the new undergraduate fee structure could hurt postgraduate recruitment further (at least on those courses leading to public sector professions), I was more intrigued by the figures put forward by Johnston about the regressive nature of the fee repayment system. If your starting salary is £25k, total repayments are £57,526. If your starting salary is £30k, total repayments are £50,943. If your starting salary is £40k, total repayments are £44,354. Incidentally, for students who take out a full maintenance loan (£7,675 per year) on top of the £27,000 fee loan, it’s a similar story. If your starting salary is £30k, your total repayments are £135,914. But if your starting salary is £40k, total repayments are only £104,105. It should be noted that the regressive nature of these repayment totals are partly the result of assumed starting salaries being relatively generous. For ‘fees + maintenance’ borrowers on lower starting salaries, the debt-wipe concession kicks in after 30 years. But how progressive is a repayment system that squeezes much more from middle-earning graduates than it does from high-earning graduates? Martin Lewis’s Independent Student Funding Taskforce reckons that fee levels are “irrelevant to most people – they’ll just keep paying the same proportion each month and if they don’t earn enough, they won’t come close to paying back what was borrowed (never mind the interest).” But once real graduates find themselves repaying different levels of debt over different lengths of time, I wonder whether they’ll be quite so blasé? Johnston’s excellent blog (and startling graph, reproduced above) warns that unprecedented levels of debt will put further study beyond the means of most graduates. However, once the unfairness within the repayment structure begins to bite, it may not only be aspiring postgrads who feel aggrieved. Thousands of graduates may wonder why their bill is so much greater than fatter-salaried friends who took the same degree at the same time. This entry was posted in 2012 Fee Structure, Student Debt and tagged debt, interest, postgraduate study, ron johnston, student loans. Bookmark the permalink. ← Does the ‘Attainment Gap’ get Russell Group universities off the hook? it is great article but some problem for your article their you were not mentioned proper education loan rate of interest can u further details.